At this time of year it's all too easy to get caught up in the collective consumerist craziness. Even wannabe minimalists like myself find themselves agonising over whether the gifts bought are good enough, the decor fashionable and whether they can really wear the same party outfit that they wore last year. I have found myself obsessing over these matters recently. Luckily I've seen sense and remembered that less has its own magic. Last year's party outfit worked after all and I still like it - who am I trying to impress? I have bought one or two new items this year already that are enough to give it a twist (new earrings, black jeans and smart jacket) and I have different shoes that I can wear too (black patent courts). Despite having reduced my Christmas decs I still have more than enough for my small house. And if I have gift buying dilemmas I will stick to buying consumables. This year I want to enjoy the traditions of Christmas and enjoy a little more baking and crafting but I don't need to put myself under the pressure of perfection. This year for me, it's time for a little more restraint both financially and emotionally. 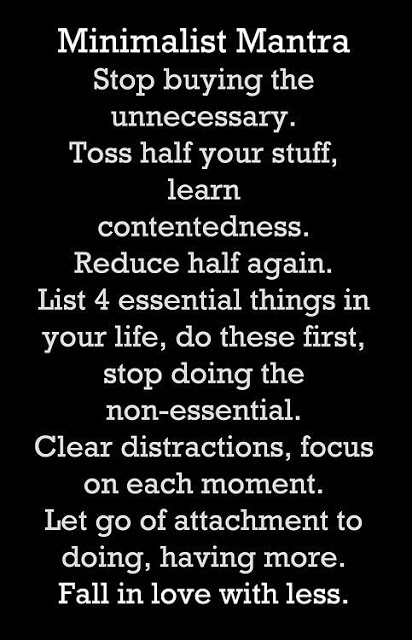 Less buying, less doing and more being in the moment. This December I shall enjoy the magical moments of Christmas but I also hope to enjoy quite a few moments that aren't festive. Wear your best smile and no one will notice what you are wearing. Just think back can you remember what others were wearing last year? The lure of Johnny Boden's 50% discount is the reason why I'm on the laptop. Your wise words are helping me think twice. Thanks. Love the minimalist mantra. I don't overdo Christmas, I aim for just enough. The shops, the adverts and the disposable rubbish make me feel a bit sick. You talk a lot of sense. I always feel calmer after a visit here! In planning Christmas I try to think how I will feel after Christmas - will I think that was lovely, relaxing with just enough of everything. Or will I feel sick, stressed and skint? This stops me overspending and over indulging! Ah, What DOES work with teenagers! Tell me do! Agreed, the only gifts I buy now are consumables, gift cards, or money. For the teenagers that drive I bought them gas cards, and the ones that don't drive yet - gift cards for Amazon. They can choose for themselves what they'd like. Easy and no stress, it's a win win! I really believe contentedness is the way to go. I find being around people who feel the same way is one way to stay on the straight and narrow. I got lured in, in the past to being something I am not. So I now buy for me and no one else. I have been on a minimalist journey this year. I have a small wardrobe of clothes instead of the masses I thought I needed. It's blogs like yours Claire which keep me on the straight.